National waterbird monitoring started in 1947, and reports in various guises have been produced covering every year since then, containing population changes and other results from the scheme. Annual reports for every year back to 1969/70 can be downloaded, plus a selection of National Wildfowl Counts reports from the 1940s and 1950s. Today the WeBS annual report Waterbirds in the UK is published each spring and comprises a summary report and statistics, maps and plots accessible through an online interface. The WeBS Newsletter is produced annually in the autumn to give counters updates on what has been going on, primarily in WeBS, but also in the wider world of waterbird conservation. The latest issue of the WeBS Newsletter is available to browse online, and previous issues are also available to download. 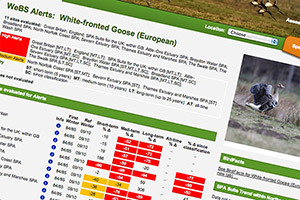 The WeBS Alerts Report is produced every three years to monitor changes in numbers of wintering waterbirds in the Constituent Countries of the United Kingdom, Special Protection Areas (SPAs) and Sites of Special Scientific Interest (SSSIs). 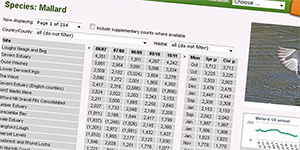 WeBS Alerts results are now available to browse online and are also published as a standalone document. Other than the Annual WeBS Report, other publications have been produced, including the Estuarine Waterbirds at Low Tide book. A list of reports and papers published using WeBS data. A list of WeBS articles that have been published. WeBS has launched a new leaflet, ‘Make your day out count’, aimed at encouraging casual one-off counts of small sites.